This week students in Years 10 and 11 represented Loreto Normanhurst at the Hornsby Ku-ring-gai Youth Mental Health Forum at Macquarie University. The theme for this year’s event was, ‘Be comfortable in your own skin, mental health is more than just the mind’. This initiative, in its eighth year, is organised by Mr Matt Kean MP, Member for Hornsby and enables our students to be part of a wider community forum to discuss and engage in conversation about mental health illness amongst local teens. I am sure you will appreciate the reflection by Jaya Reddy below. “On the 9th of April myself and students in Years 10 and 11, accompanied by Mr McGee and Mrs Hodgetts, were privileged to attend the 2019 Macquarie University Mental Health Forum. 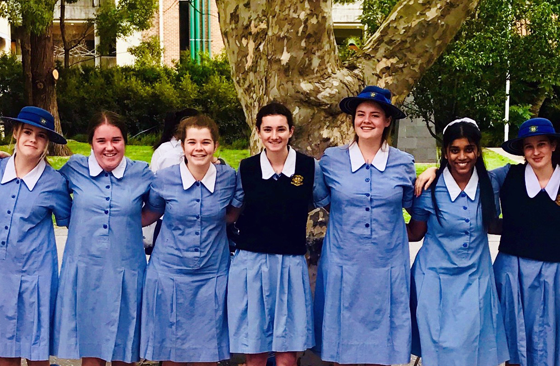 Loreto Normanhurst was amongst 22 other schools that attended, all excited to broaden our knowledge and awareness of mental health issues. The forum began with an introduction, not only to the hosts of the forum, but to other participants where we engaged with other schools and spoke to each other about our personal understandings and knowledge surrounding mental health issues. We were also able to interact with companies and programs aimed at raising awareness about mental health wellbeing. It was a privilege to hear personal stories from survivors who had experienced mental health illness at some stage in their lives, realising that mental health illness does not discriminate against anyone. We were then enlightened by a panel of highly qualified health professionals from different backgrounds who answered questions and informed us on how to improve our mental health, how to seek help for a mental health illness, how to recognise a mental health illness and how to maintain a sense of balance. The forum ended with each school coming up with their own projects that they would implement in their school community that aims to promote and guide people on having a greater understanding of mental health issues and overall wellbeing. These ideas were pitched to everyone attending the forum. SchoolTV is a digital resource for parents to assist in navigating your way through the challenges of modern-day parenting. Every month, Dr Michael Carr-Gregg introduces a new topic and interviews specialists to offer their advice. Information is presented in bite-size pieces that you can watch and read anywhere at any time on any device. Click the image SchoolTV image to access the website. Please bookmark for easy access in the future. A reminder that all Term 1 absences should now be finalised. The most efficient way is to send an email to attendance@loretonh.nsw.edu.au or have your daughter return a signed note to Student Services. As the term draws to a close I take this opportunity to wish you all a peace-filled Easter and hope students have a well-earned break. School returns on Monday 29 April in full winter school uniform. If you have any questions do not hesitate to email me.